Discover the 3D "The Thinker" Crystal Puzzle by assembling 43 differently shaped transparent pieces! 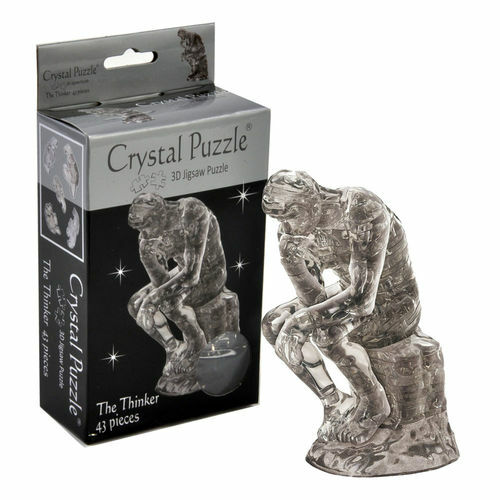 Often used to represent philosophy and knowledge, The Thinker portrays a man sitting on a rock, chin on hand, deep in thought. Work from the bottom up, putting your model together piece by piece. It's not as easy as it looks, some parts are virtually identical! It's helpful to prepare the order of assembly and use the instructions to your advantage before you start. When you're finished, you'll have a one of the most celebrated sculptures every known adorning your desk! Perfect for budding artists, philosphers or poets.